Due to poor weather "The Three Creeks Race" sadly didn't run this year. It's one of the more obscure and interesting yacht races in the Solent calender. Starting as it does on the quay at Ashlett Creek below, competitors can bring their yacht alongside, or anchor outside in deep water and make their way to the quay by dinghy. Use of the outboard is permitted. Ashlett is a small drying creek on the western side of Southampton water, just north of Calshot Spit . 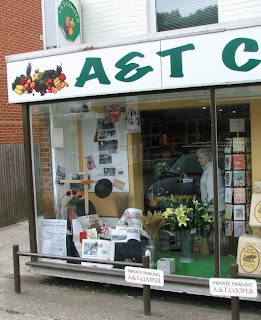 The Ashlett Sailing Club has it's clubhouse in the old tide mill, is very friendly and well worth a visit. From Ashlett the first leg of the race takes the fleet down the western Solent into Newtown Creek on the Isle of Wight or the "South Island" as the locals like to call it. Here the boats have to anchor and then take the dinghy ashore to the quay at Shalfleet in order to finish the first leg. 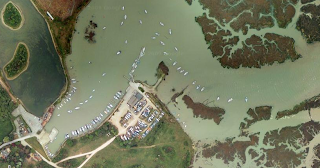 Newtown Creek is owned and managed by the National Trust and is a wonderful and unspoiled part of the Solent, where curlews, oyster catchers and egrets are disturbed only by the visiting boats who stay overnight. On Sunday the race starts again, this time an anchor down start outside the entrance to Newton Creek. The boats make their way past Cowes and into the Eastern Solent, finishing at Wootton Creek and the Royal Victoria Yacht Club for lunch and prize giving. Below, one of the regular winners Greg, inspects his anchor at the start of the 2005 race, which he went on to win in his Memory Class. Wootton Creek below (and the village of Fishbourne which is located on the eastern side of the creek) between Cowes and Ryde on the Isle of Wight. 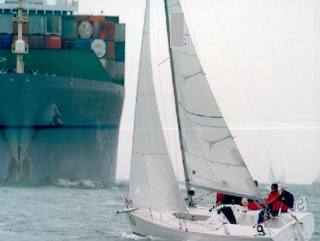 We like to think of the Solent as providing a safe and protected sailing environment, however the Southampton Harbour Master Captain Philip Holliday, recently issued an open letter to yachtsmen advising of the dangers of close quarters navigation with shipping. 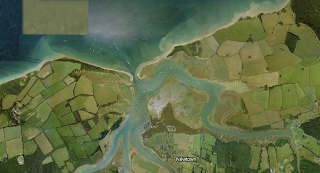 This image from google maps shows the Solent, a stretch of water separating the Isle of Wight from the mainland. 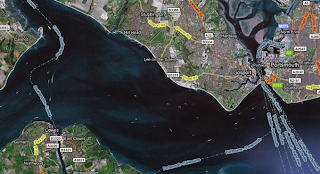 The area has two major docks, one up Southampton water to the top left of the picture and Portsmouth with it's naval dockyard visible to the right. 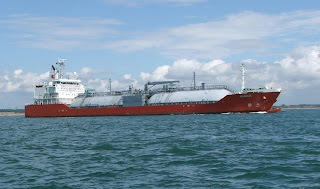 Not to forget the oil terminal at Fawley in Southampton water, from where fairly large tankers like this one come and go on a daily basis. 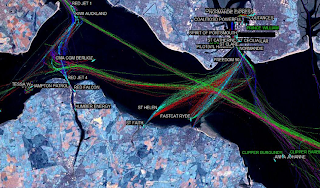 This overlay map from shows the AIS tracks of shipping in a single afternoon. giving some idea of the density of traffic. 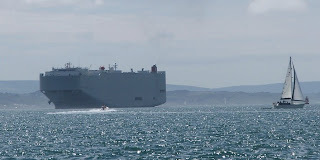 To make matters worse, the deep water channel takes large shipping in a big loop around the Bramble Bank , north of Cowes, before heading up into Southampton water. In this area ships have a moving exclusion zone 1000 meters in front and 100 meters either side, where small craft are fobidden. Even in these difficult conditions these big ships move fast and can come up on a small yacht very quickly. 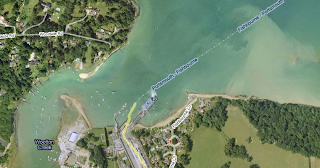 Southampton Harbour Master has an excellent guide for yachtsmen on the VTS web site - the old myth about power giving way to sail does not apply here. 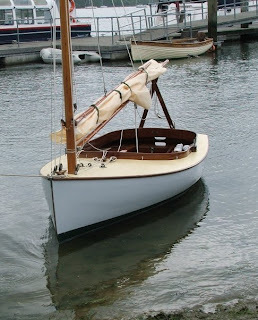 Over at 70.8% Thomas Armstrong has just done a nice post about a newly launched catboat Silent Maid. Built by the Independence Seaport Museum as a replica of the 1924 cruising yacht, Silent Maid is 33 feet LoA. Tom's post got me thinking about catboats. 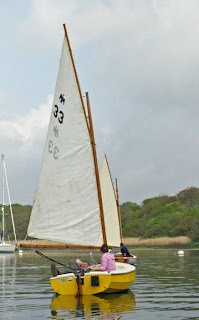 Although uncommon in England, I've been interested in the cat boat type for many years, most famous of which is the Beetle Cat characterised as they are by wide beam (up to half their length) and a large single sail set right up in the bows. 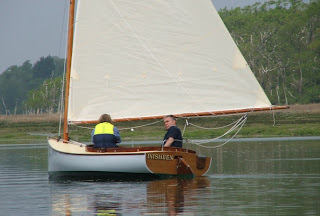 British boat builder David Moss from Lancashire built a small, classic catboat during the 1980's, an example here Inisheen sailing on the Beaulieau river a couple of years ago. 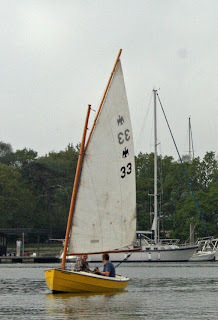 David also built a larger 16' catboat around the same time. 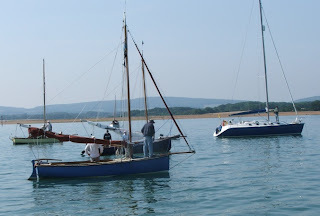 My own cat boat is Tosh , a Cormorant dinghy built by Cornish Crabbers. 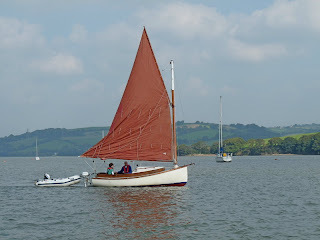 Designed by Roger Dongray, she is a modern interpretation with a high aspect gaff sail and narrow foils, rather than the traditional barn door rudder, just the thing for a lazy day sailing along our wooded rivers. 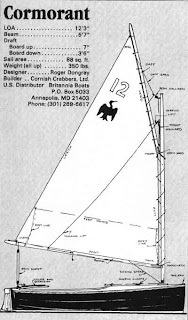 Her dimensions are beam 5'7" and length 12'3", which puts here close to the "two fathoms long and a fathom wide" catboat description by Bill Garden in his delightful book "The Making of Tom Cat". 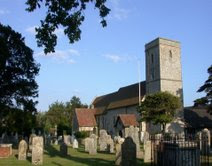 Just down the river, the village of Hamble-le-Rice is celebrating 900 years of the Priory Church of St Andrews this year. Led by St Bernard of Thiron, monks came from France in 1109 and settled on the shores, by the mouth of the river, founding the abbey and priory church, which still today contains some fine examples of Norman building. More recent, but none the less interesting is the church’s 19th century stained glass. Over the bank holiday weekend - August 28th to 31st there will be a flower festival at the church, reflecting the rich history from medieval time to present day. The idea of the festival is that floral displays will be mounted in the church and the adjacent Priory Centre. Farming and domestic life of the original monks will feature, as will other aspects of the Church’s history such as the sacking and burning of the church by French raiders in the 1300’s (bound to be popular with the kids!!). 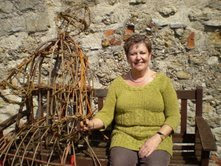 Christine Wright shown here, has been responsible for the design of many of the displays. A carpet of flowers is planned, dedicated to St Andrew the patron saint. 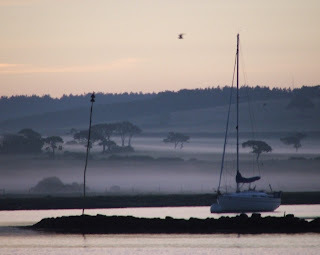 In addition scenes of the life of the village will play a central role in the festival, originally a fishing port, Hamble is now a popular yachting venue, which also has strong association with aviation. 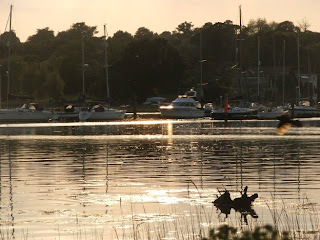 With the regatta at Bursledon being held over the same weekend, it looks like we will be having a busy time and even more reason for people to visit to the area. 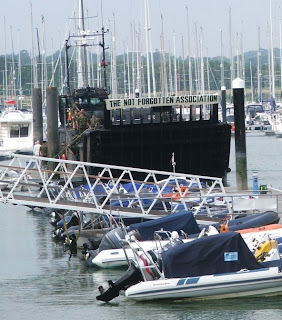 Members of the armed forces had run 90 miles over three days from London to Warsash where they boarded this modern landing craft, which had taken a day off from active service as part of the D Day celebrations. The event was organised by The Not Forgotten Association on behalf of disabled ex service people, the runners were active service personnel. 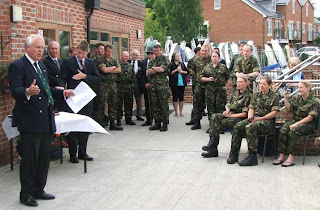 After a trip up river to Bursledon, passengers and crew embarked at the Royal Air Force Yacht Club in Hamble for a BBQ, speeches and prize giving. Sixty-five years ago the allied forces embarked on one of the most remarkable military operations, the landing on the beaches of occupied France which led to the liberation of occupied western Europe. Walking along the river on the eve of the anniversary, it's hard to imagine the scene on that momentous day, not so long ago. 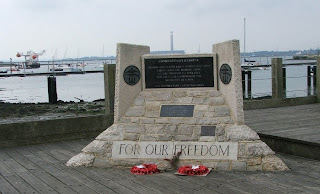 This memorial on the quay at Warsash, celebrates the British and Allied Naval and Commando units who left the river on 5th June 1944. 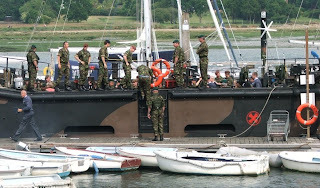 Around 3000 commandos embarked from Warsash pier, in landing craft which had been lying in the river. Some 80 landing craft set off across the channel as part of the 1st LC Squadron HMS Tormentor. Comprising the 200th, 201st and 202nd Landing Craft Flotillas, were men of the No 3 and 6 Army Commandos, No 45 Royal Marine Commando, French Commando, 1st Battalion Fusilier Marines, destined for Gold Beach Normandy. Also No 41 and 48 Royal Marine Commandos embarked from Warsash Pier. The memorial is made in the shape of a landing craft bow. 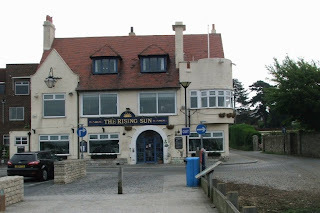 Military operations were run from the Rising Sun pub adjacent to the pier. The scene this morning was very different, with slightly somber low cloud. Locally the events of 65 years ago are well remembered, later today in Portsmouth an RAF Hercules will drop a million red poppies over the city. Our local green grocer has also joined in the celebrations with this window display . This post, in it's small way, is to honour all the men and women involved in that epic day. The commute from Southampton to London is bad enough normally, but after such a fantastic weekend it's especially bad. We’re pulling out our hair! You’d think they wouldn’t dare! You’d think they have a spare!